The 2nd of January is always tinged with sadness as we remember our friend David R Ross' passing, has it really been five years? We also remembered our dear friend Duncan who sadly passed last year, we miss both of them like you wouldn't believe, and to both their families we extend our love and support, especially at this time of year in particular as we can't imagine how you must be feeling, we also remember our friend Lachlan as well on this day. See more on the page itself. Well, what a great weekend that was. 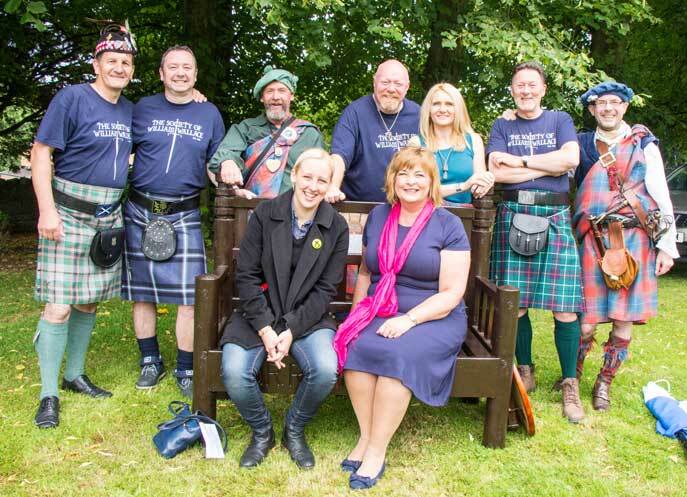 A big thank you to the Andrew De Moray project for their tireless devotion to this event and for me it was very special as it was the first time I had attended. 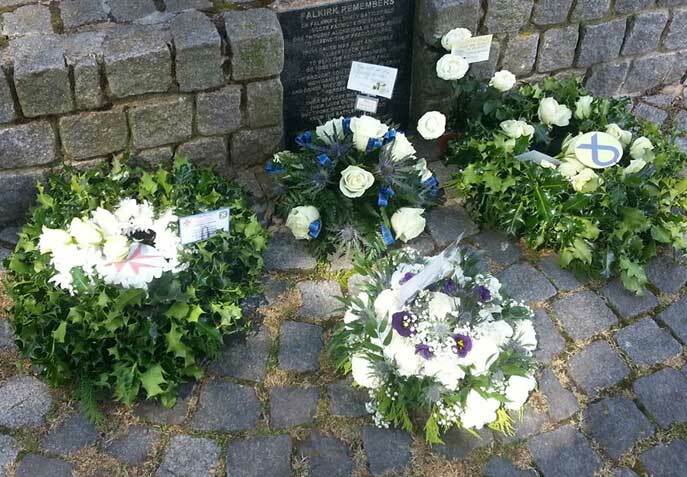 I'd heard so much in the past from David and Duncan about how special this commemoration was, and they were right. See more on the page itself. A huge turn out this year as the weather held good and we commemorated the fallen of both battles in the warm sunshine in the shadow of Loudoun hill. 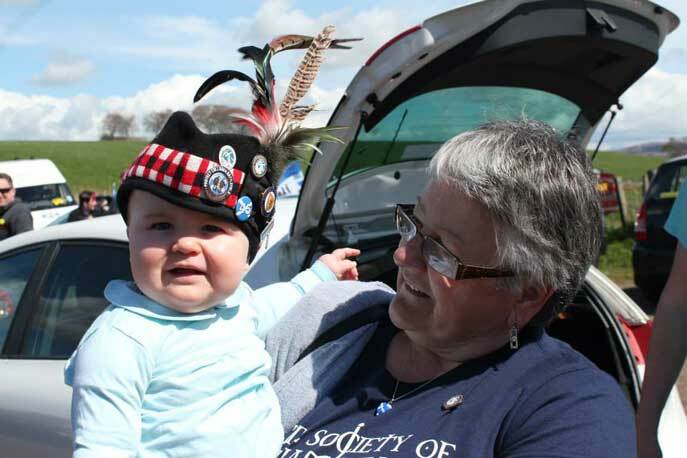 Special thanks to The Strathleven Artizans who once again co-hosted this event with The Society of William Wallace. Our marvellous speakers George Kempik, Lesley Matthews, Jean Brittain, Ken Shirra and our wreath layers this year, Elaine Kerr Kempik for the SOWW and Kate Smith for the Artizans. See more on the page itself. The Society all met up at the Bruce Hotel and then travelled down to Stirling Bridge for the speakers and some songs. You would have thought that your friends in the Society, knowing I had missed Dublin for the football and was gutted about it would not have said much but it was Dublin this Dublin that... It was a great sight once we had parked our cars and walking down and seeing all the tartan, saltires and lion rampants awaiting us. See more on the page itself. 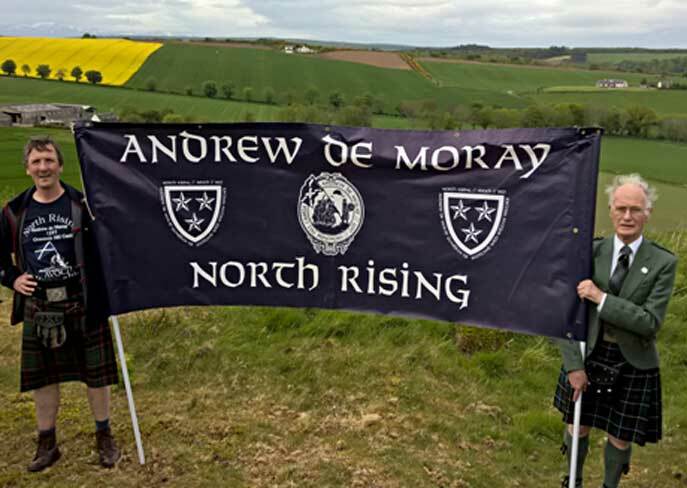 The day was dry, but extremely windy as we gathered at Falkirk Trinity for the march off to the cairn. 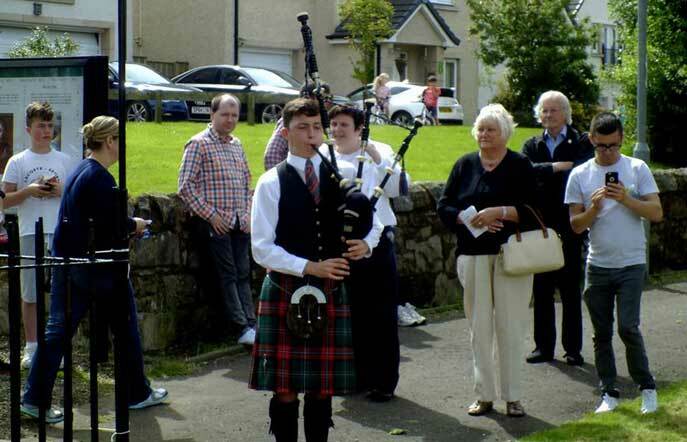 After the customary laying of the wreaths in the churchyard to Sir John the Graeme, Sir John Stewart of Bonkyll and the Men of Bute, we formed up behind the colour party of Gordon, Paul and Fiona, and marched off to the stirring sounds of the Uphall Station Pipe Band down through Falkirk High Street. See more on the page itself. When the Wallace Chair was first mentioned my ears pricked up. I thought I was the very man for the job and ultimately I was honoured to be asked to make it. The initial photos we found were pretty poor, but I managed to work out a few details about the way the chair was constructed. It consisted of six important pieces of timber - four round posts and two heavy cross rails. It looked like it was made from oak, and in a pretty poor state of repair, with rot and worm causing a lot of damage. The chair was also covered in a loose leather cover, which hid a lot of the other detail. 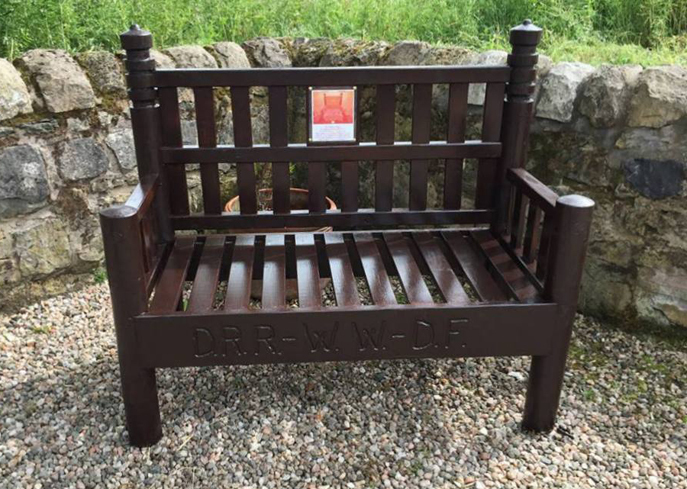 We made some enquiries and were sent some close up pictures of the chair by its present owner and these helped immensely. From that, I did a rough sketch and it was agreed we would try to make the chair into a two-seater bench from pressure treated softwood. See more on the page itself. 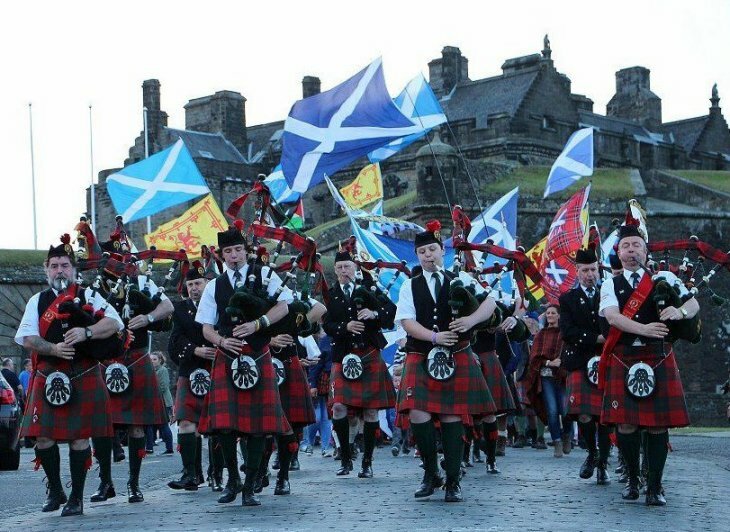 It was a beautiful clear evening as we assembled at Stirling Castle to march down to the battle site. 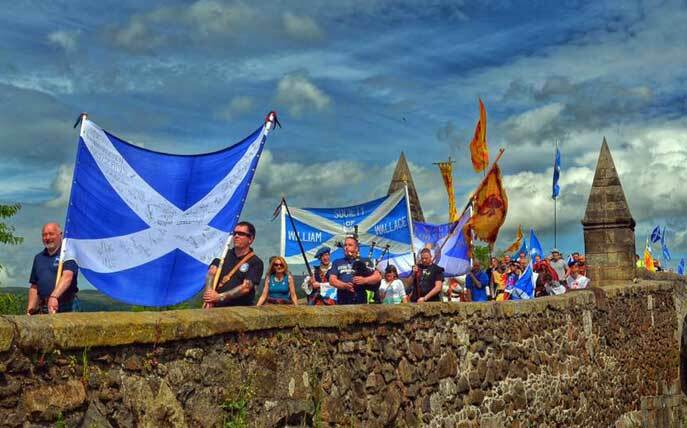 Well attended as ever, it was a glorious sight to see so many Saltires flying as we crossed Stirling Bridge to gather around the newly erected flagpole. Ted Christopher, who organises this event, welcomed all those in attendance and told us of the progress being made on the next phase of the site commemoration - a statue built on the north bank of the river Forth of William Wallace and Andrew de Moray, as well as an education programme for local children on the history of the two great men. See more on the page itself. At the end of September I received an email from Liane Cummings, a young Scottish woman now living in Luebeck, Germany. Liane and I met at Bremen airport in 2014 and she noticed the Society of William Wallace badge on my jacket. 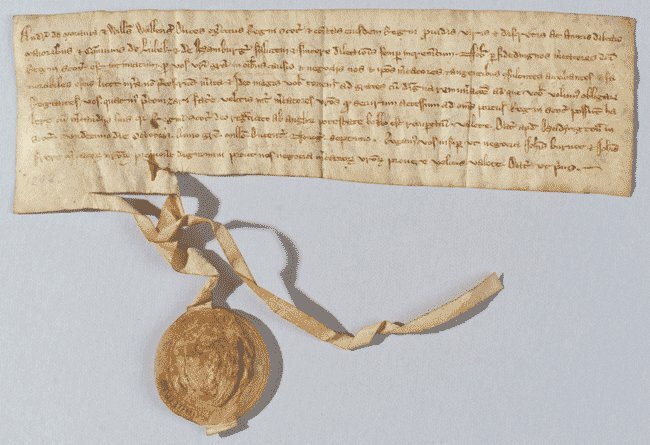 We soon found out that we shared a passion for the original Luebeck Letter, written by William Wallace shortly after the battle of Stirling Bridge. Liane was determined to promote the Luebeck Letter and organised a Wallace Day in Luebeck in 2014 to commemorate this important document. See more on the page itself.